Update, 9:55 pm EST: It’s a Thanksgiving miracle: apparently it now looks like ISON has actually survived!! Alright we're calling it, and you heard it here first: We believe some small part of #ISON's nucleus has SURVIVED perihelion. 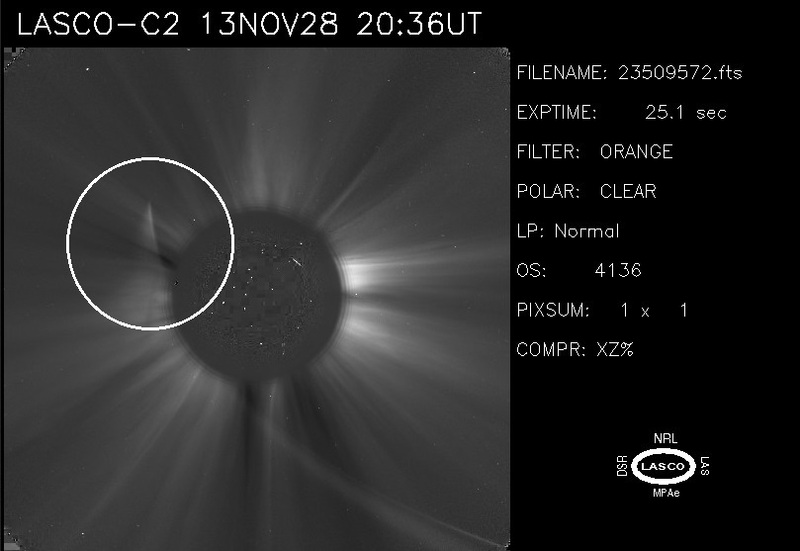 Image from SOHO indicates a chunk of Comet ISON has survived its close pass of the Sun. Credit: NASA/ESA/SOHO. Update, 8:35 p.m. EST: Uncertainty about Comet ISON’s fate likely will persist for some time. Karl Battams just tweeted that after 2,000 sungrazing comet observations, he has never seen brightening in the same way that ISON (or its remains) appear to be doing right now. We’ll keep watching. Real-time images are available on this website. 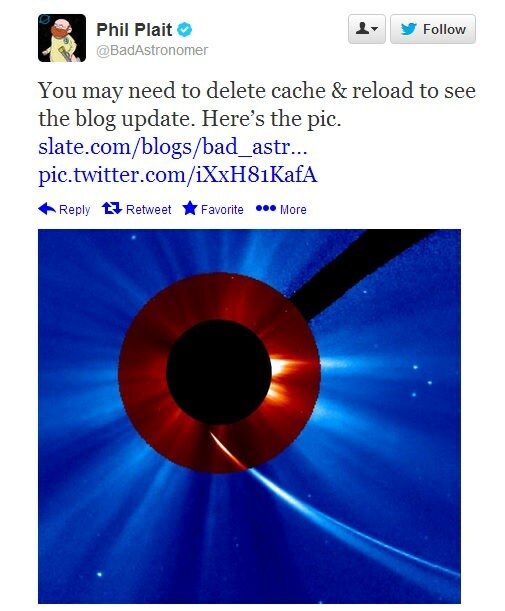 Update, 4:40 p.m. EST: On Twitter, the European Space Agency (quoting SOHO scientist Bernhard Fleck) said the comet is gone. Separately, the Naval Research Laboratory’s Karl Battams posted that he thinks recent observations show debris from ISON, but not a nucleus. Astronomers are still monitoring, however. Update, 3:56 p.m. EST: Something has emerged from perihelion, but the experts are divided as to whether it’s leftovers of ISON’s tail, or the comet itself. Stay tuned. The fate of Comet C/2012 S1 ISON is uncertain. It made its closest approach to the sun today (Nov. 28) around 1:44 p.m. EST (6:44 p.m. UTC). As of Thursday night, what’s happening to the comet is still unclear, as observers try to keep up hopes for a good comet show in the next few weeks. It will take a few more hours until NASA and other agencies can say for sure what the comet’s fate is. That said, there still is valuable science that can be performed if ISON has broken up — more details below the jump. 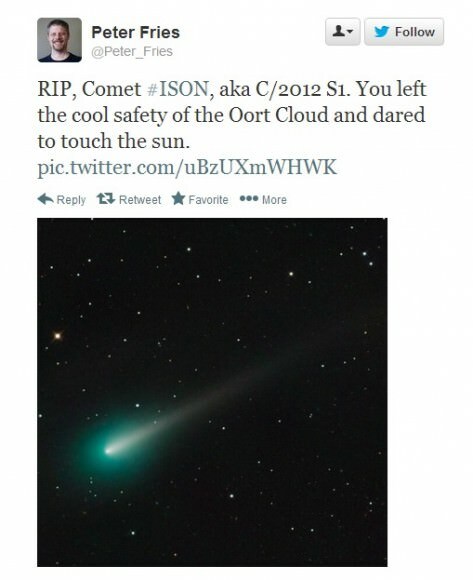 ISON coincided with American Thanksgiving, causing a lot of astronomers and journalists to work holiday hours while pundits made jokes about the comet being “roasted” along with the turkey. Meanwhile, amateur astronomer Stuart Atkinson — author of the Waiting for ISON blog — was among those eagerly awaiting the comet’s closest approach. But as the comet made its closest approach, astronomers grew more and more skeptical than it had survived. Phil Plait (who writes the Bad Astronomy blog on Slate) pointed out that the comet’s nucleus appeared much dimmer than its tail in images from SOHO (Solar and Heliospheric Observatory), NASA’s sun-gazing spacecraft. This implied that the nucleus was disintegrating. Plait and Karl Battams — a Naval Research Laboratory astrophysicist who operates the Sungrazing Comets Project — both participated in a NASA Google+ Hangout on ISON. As of about 2 p.m. EST (7 p.m. UTC), both said that they believe ISON is an “ex-comet”, although it will be a few more hours before scientists can say for sure. The challenge is that the two spacecraft used to watch ISON swing around the sun — the Solar Dynamics Observatory and SOHO — are not necessarily designed to look for comets. Battams and Plait initially said that it sometimes take additional image processing to view information in it. more As time elapsed though, both expressed extreme skepticism that the comet survived. Even if the comet is dead, Plait pointed out that scientists can still learn a lot from the remaining debris. ISON is believed to be a pristine example of bodies in the Oort Cloud, a vast body of small objects beyond the orbit of Neptune. Examining the dust in its debris trail could tell scientists more about the origins of the solar system. “The fact that it’s broken up is really cool. There’s a lot we can learn from it and a lot we can get from it,” he said. For others, the comet served as an inspiration for daring to be courageous. Looks like some of ISON may have made it!!! 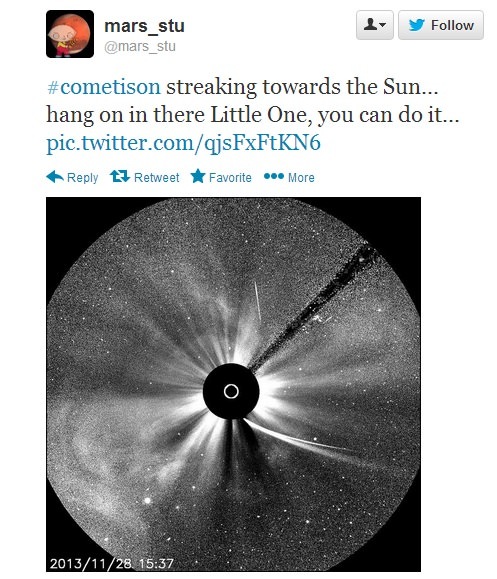 Well, there goes all that hype about “Super Comet” Ison. A shame, too. To paraphrase Mark Twain: Rumors of my death have been greatly exaggerated. I can’t believe how much I fell for the hype around Ison. There were plenty of warnings for caution by scientist who studied this and who tried to calm down the hype of “comet of the century”, “brightest in human history”, “brighter than the moon” and all that. Always thought those may be exaggerations but in the end when on SOHO’s pictures there is nothing but noise I was so disappointed. Why? Because in spite of my self-image to be a critical reader and fact checker, here I completely failed and fell for it: It was just too fascinating to expect a major spectacle in the December sky. And somehow I must have believed that hype is only restricted to politics and the commercialization of new products. All of that was completey possible, but it was all contingent on ISON making it around the sun. Since we did not know what the material make-up of ISON was with any certainty, it was a lottery of sorts. ISON turned out to be mostly loose ice and it got vapped by the SOL. That’s how these things go. Can you say, “Bummer”? or is that a WOW? Still too early to say for sure… The surviving remnant may yet perform a phoenix-like return from the dead? LASCO images from the SDO show that some of C. ISON did survive it’s ‘death plunge’.. Just how bright it will be.. only time will tell, but hang on to that optimistism! Hope upon hope that this comet may STILL become a phenom…. would like nothing better than for it to capture the public eye with a continued showing and create a few new astronomers! YES!